Samsung has recently launched a its premium mid range smartphone Galaxy A8 in India. The device comes powered by Qualcomm Snapdragon 615 clocked at 1.5 GHz. The other specs sheet of the device includes 2GB RAM, 32GB internal memory, 16MP rear shooter and 3050mAh battery. Here are few tips and tricks that can help you to explore the device easily. How to insert the SIM card on Samsung Galaxy A8? Samsung Galaxy A8 is the Samsung’s slimmest smartphone that was launched recently. It is dual SIM smartphone and supports dual standby. The two SIM port are on the left edge of the device, as the back panel of the device is not removable. The SIM2 tray has a dual option, i.e., either you can insert the SIM or else you can insert a Memory card into it. So, to insert an SIM on this device, you need to open the SIM tray that is on the left edge by using the ejection pin. Now, insert the SIM, place the tray in the respective slot and boot your device. You have successfully inserted SIM on your Samsung Galaxy A8. How can we share your Data network via Tethering on the Samsung Galaxy A8? Every device these days got a feature where you can share your internet with others. To access this feature on Samsung Galaxy A8, Open the settings, in the connection list, click on Mobile hotspot and tethering. Select the type of hostspot that you want to use and create SSID name and Password for your device. How to take a Screenshot on my Samsung galaxy A8? Taking a screenshot on a Samsung Galaxy A8 is very simple. All you need to do is place the finger on the left side of the screen and swipe it from left to right. Your screen is captured in the form of the screenshot. There is one more way to take a screenshot of your device, i.e., press the power/lock key along with the home key. You have successfully captured a screenshot of your device. How to check for the Android Updates on Samsung galaxy A8? To check the updates on Samsung Galaxy A8, Open the settings. Scroll down to About Device and tap on it. Now, in the new list tap on Software updates and further tap on Update now. The device checks for updates and if there are no updates available on the device. Then, a message stating ‘The latest updates have already been installed’ is displayed on the screen. How to Install external apps with apk files on the Samsung Galaxy A8? If you want to install any external app on the device, then you need to enable the Unknown Sources option on your device. To enable this option on Samsung Galaxy A8, Open the setting, click on Lockscreen and Security. Head on to Unknown Sources and Tap on it. Click the OK button in the popup and the Unknown Sources option is enabled on your device. Now you can install any external apk on your device without any interruption. The Notification Panel of the Samsung Galaxy A8 is unique from all the other Samsung devices. To customize Quick setting on the device, Open the notification panel from the top. Click on the edit button on the notification panel and drag the options among themselves so that you can arrange them in order. Ten options would be displayed on the notification panel in the from a row with Five options visible and the other five option are displayed by sliding that row from right to left and vice-versa. How to use the Power saving modes on the Samsung Galaxy A8? Power saving mode helps you to improve the battery life in the case of emergency. To enable this option on your Samsung Galaxy A8, Open the settings and click on battery. There are two types of power saving modes available on your device, i.e., power saving mode and ultra power saving mode. Power saving mode helps you to save battery power by limiting the maximum CPU performance, reducing screen brightness and frame rate, turning off the touch key light, disabling Vibration feedback. Ultra Power Saving mode helps you save your battery by applying a simplified grayscale theme to your home screen and limiting the number of usable apps. Select the type of the Power saving mode and click on that to enable it. If you select the ultra power saving mode, then there would be limited options, and you can access your device. To disable that option you need to click on MORE on the screen and then Tap on Disable Ultra Power Saving Mode. Your device is back to the normal format, and you will be able to access all the apps. Direction, Acceleration, light, E-compass, proximity are the few sensors available on the device and hence helps in automating the device. Are there LED notification lights on the Samsung Galaxy A8? There are no LED notification lights on the Samsung Galaxy A8. How to use the Screen pinning feature on the Samsung Galaxy A8? Every device with Android Lollipop has got screen pinning feature in it. To enable this on your Samsung Galaxy A8, Open Settings, Click on Lock screen and security. Further, Scroll down to Other security settings and tap on it. Now, in the new list scroll down to Pin Window option and tap on it. Click on the Off button to enable it. Now open the recent menu by pressing on recent key and tap on pin option that is on the right corner of the screen. To unpin the screen, you need to press and hold the recent and back keys at the same time. If you want to unpin your pinned app, there is another option. Use screen lock type to unpin which you need to enable while enabling the pin option in pin window and select the type of lock screen which you want to use. What are the Pre-installed Apps on the Samsung Galaxy A8? Internet browser, Radio, Email, S Planner, S Voice, Galaxy Apps, Smart Manager, all the Google related apps are few of the apps that come pre-installed on the device. The device also comes with some of the bloatware apps like wechat and Microsoft One Drive, one note, Skype are some of Microsoft apps on it. Can I Move apps from phone storage to SD card on Samsung Galaxy A8? Yes, there is an option where you can move an app from phone storage to SD card on your device. This option is only applicable when you insert a memory card in your device. How much is the internal storage on the Samsung Galaxy A8? The devices come with 32GB as its internal storage, where system occupies 6.63GB, 310MB is the used space, 16.92MB of cached data and 2.15MB of Miscellaneous Files are present on the device. How much free RAM is available on the Samsung Galaxy A8 if no apps are running? Samsung Galaxy A8 comes with 2GB RAM where the system uses 846MB of RAM; internal apps uses 233MB and 762MB of free RAM is available when no app is running on the device. How to use the fingerprint option on the device? A fingerprint scanner is an advanced option available on this device. To enable this option on your device, Open the settings, Click on Lock screen and security. Further Tap on fingerprints and click on add fingerprint. A message stating press finger on a home key, lift it off, and then repeat is displayed. Follow the actions and when you reach 80% Place, the Tip of the same finger on Home key is displayed. Click on continue and scan the tip of your finger. One it is scanned a message stating success is displayed and head over you to Create backup password. In this, you need to set a backup password for your fingerprint. Further, Set screen lock type popup appears on screen click on Set to enable the fingerprint lock or else you can click on later if you want to do that later. You have successfully inserted Fingerprint for home screen lock. How to remove fingerprint from your device? To remove the fingerprint option on Samsung Galaxy A8, Open the settings, click on the Lock screen and settings. 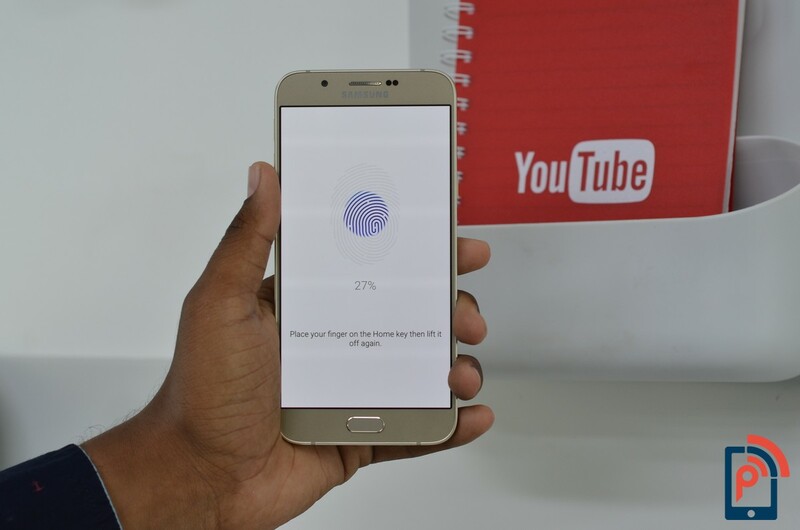 Further tap on a fingerprint button, you can proceed further either by placing the finger on the home screen to identify or else you can use the backup password that you have used for backup while scanning for a fingerprint. Once you complete verification, Click on the fingerprint that you want to remove and tap on the Remove button a new pop appears. Click on remove, your fingerprint is successfully deleted from the device, and you can now add a new fingerprint. What are the Benchmarking scores of the device? We have used different benchmarking tools to test the device and here the benchmarking scores of the different apps. How to change the theme on Samsung Galaxy A8? To change the theme on the device, Open the settings, click on the Theme, select the downloaded themes and click apply. If you don’t have any themes downloaded open the theme store in the same menu, download the theme and then you can change the theme on your device. What is Galaxy Essentials and how can you use it? Samsung Galaxy A8 has got an additional feature where you can install the apps from Samsung suite to improve your device. To install the Galaxy essential apps on your device, tap on the essentials and install the apps from Samsung suite. The apps that can be downloaded from essentials are AllTogether, Kids mode, Samsung link, Sidesync3.0 Smart Tutor for Samsung, Snap biz card, S Translator, Optical Reader. You can down apps additional apps from the Galaxy apps store by tapping on galaxy app in the essential window. What are quick settings in the settings menu? What are the motion and gestures on the device? 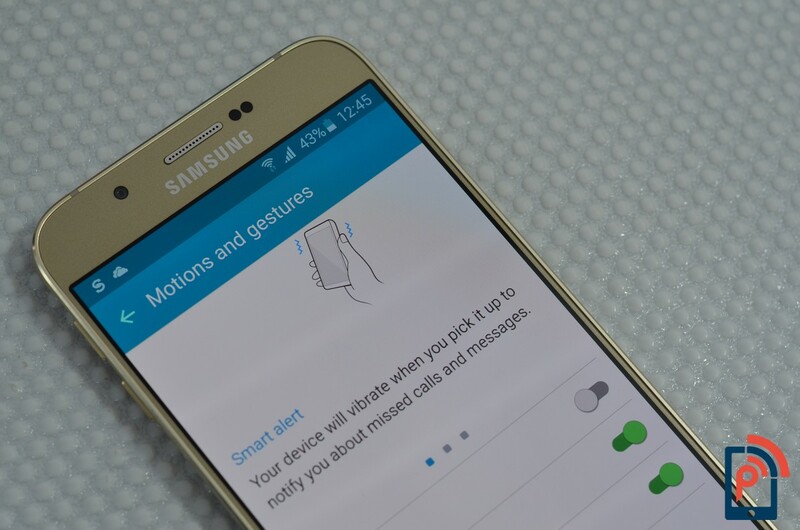 Smart alert, Mute and Palm swipe to capture are the three motions and gestures available on the device. When you activate a smart alert, your device will vibrate when you pick it up to notify about the missed calls and messages. Mute, it mutes the incoming calls and alarms when you place your hand on the screen or turn the device over. Palm swipe to capture; it helps to capture the screen by swiping the edge of your hand across it, from side to side, keeping in contact with the screen. To enable these options on screen, open the Settings, click on Motion and gesture and enable the options by tapping on them. How to enable and disable briefing on Samsung Galaxy A8? Briefing is present on the left most panel of the home screen. Sometimes you don’t want to waste your data on the briefing so you can disable it on your device. To disable this option on Samsung Galaxy A8, open the settings, tap on Application. In the new list, click on Application manager and head over to all apps. Now open the Briefing app and click on Disable button and press ok to disable on your device. You have successfully disabled this on your device. What is Smart Manager how to use it? Smart Manager is used in boosting the performance of the device and used to clear the RAM. Does this device support OTG drive? Yes, the device supports the OTG drive, and you can easily transfer the data from your device to drive. What are the One-handed operations on this device? 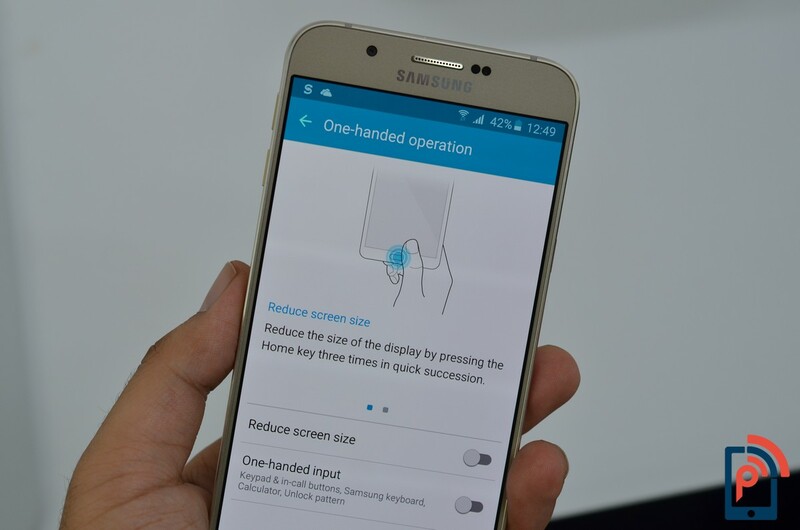 Samsung Galaxy A8 comes with two One-handed operations in it. Reduce screen size, Its reduces the size of the display by pressing Home key three times in a quick session.One-handed input, Adjust the size and position of the keyboard and other input methods for easier input with one hand. To use these operations on this device, Open the settings, click on Display. In the new list, click on the One-handed operation and tap on Reduce screen size and one-handed input to enable them. Now you can use the operations. How to open the Camera on the device quickly? Samsung Galaxy A8 comes with 16MP real cam with a f/1.9 aperture, and the front facing cam camera is of 5MP. The camera can be opened easily by double tapping the home button. Will the device get the Android Marshmallow 6.0 Update? The device comes with Android 5.1 Lollipop out of the box. There is no information about the device getting the Android 6.0 Update. You can also check the list of the devices that comes with Android 6.0 Marshmallow out of the box which we have covered earlier on PhoneRadar. There are the general tips which could help you to explore your device. If you have any other questions/queries comment below, we will get back to you.